This image of NGC 247, taken by the Wide Field Imager on the MPG/ESO 2.2-metre telescope at ESO’s La Silla Observatory in Chile, reveals the fine details of this highly inclined spiral galaxy and its rich backdrop. Astronomers say this highly tilted orientation, when viewed from Earth, explains why the distance to this prominent galaxy was previously overestimated. 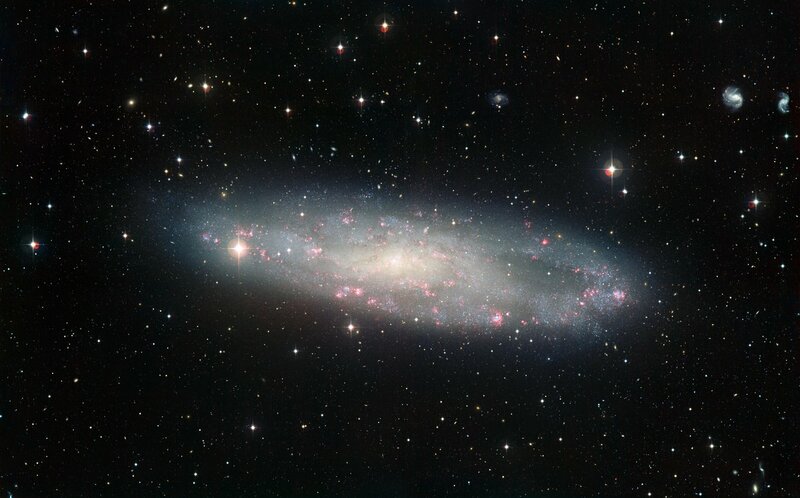 The spiral galaxy NGC 247 is one of the closest spiral galaxies of the southern sky. In this new view from the Wide Field Imager on the MPG/ESO 2.2-metre telescope in Chile large numbers of the galaxy’s component stars are clearly resolved and many glowing pink clouds of hydrogen, marking regions of active star formation, can be made out in the loose and ragged spiral arms. 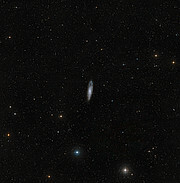 NGC 247 is part of the Sculptor Group, a collection of galaxies associated with the Sculptor Galaxy (NGC 253, also shown in eso0902 and eso1025). This is the nearest group of galaxies to our Local Group, which includes the Milky Way, but putting a precise value on such celestial distances is inherently difficult. To measure the distance from the Earth to a nearby galaxy, astronomers have to rely on a type of variable star called a Cepheid to act as a distance marker. Cepheids are very luminous stars, whose brightness varies at regular intervals. The time taken for the star to brighten and fade can be plugged into a simple mathematical relation that gives its intrinsic brightness. When compared with the measured brightness this gives the distance. However, this method isn’t foolproof, as astronomers think this period–luminosity relationship depends on the composition of the Cepheid. Another problem arises from the fact that some of the light from a Cepheid may be absorbed by dust en route to Earth, making it appear fainter, and therefore further away than it really is. 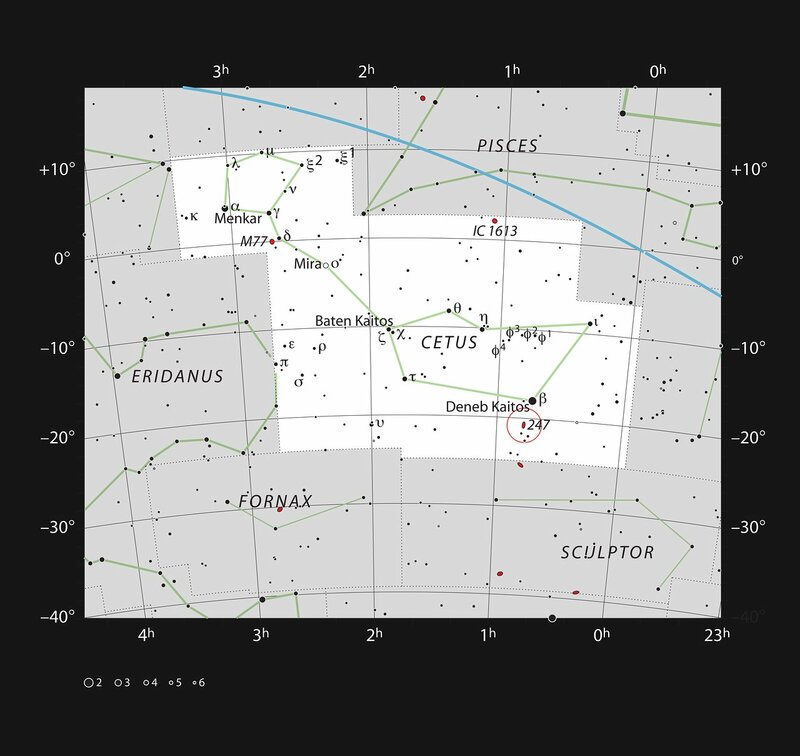 This is a particular problem for NGC 247 with its highly inclined orientation, as the line of sight to the Cepheids passes through the galaxy’s dusty disc. However, a team of astronomers is currently looking into the factors that influence these celestial distance markers in a study called the Araucaria Project . 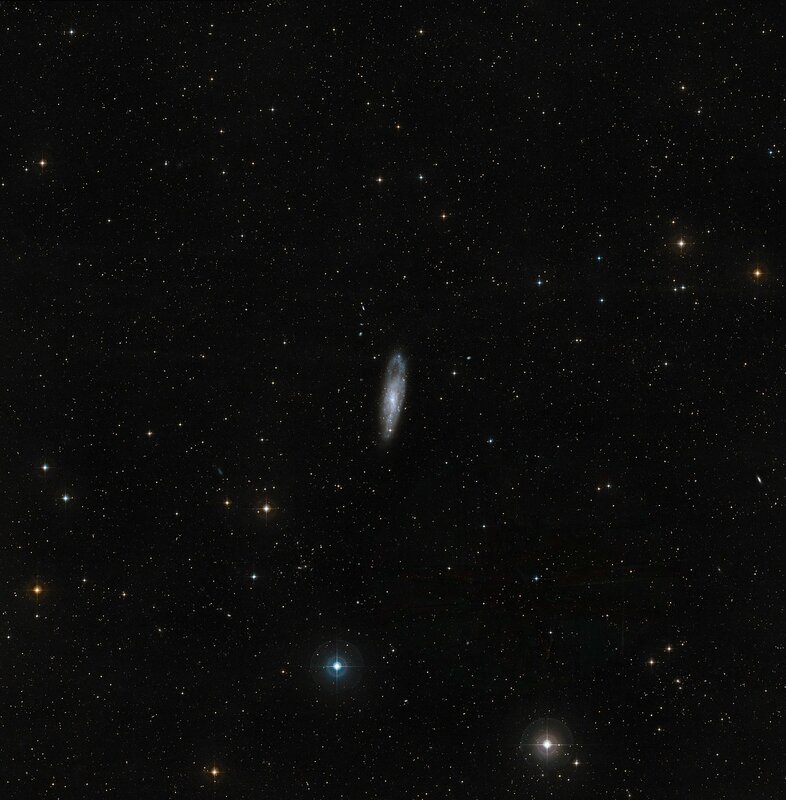 The team has already reported that NGC 247 is more than a million light-years closer to the Milky Way than was previously thought, bringing its distance down to just over 11 million light-years. This colour image was created from a large number of monochrome exposures taken through blue, yellow/green and red filters taken over many years. In addition exposures through a filter that isolates the glow from hydrogen gas have also been included and coloured red. The total exposure times per filter were 20 hours, 19 hours, 25 minutes and 35 minutes, respectively. The Araucaria Project is a collaboration between astronomers from institutions in Chile, the United States and Europe. ESO’s Very Large Telescope provided data for the project.